These US EPA air dispersion models are used extensively to assess pollution concentration and deposition from a wide variety of sources. The AMS/EPA Regulatory Model (AERMOD) is the next generation air dispersion model based on planetary boundary layer theory. AERMOD utilizes a similar input and output structure to ISCST3 and shares many of the same features, as well as offering additional features. AERMOD fully incorporates the PRIME building downwash algorithms, advanced depositional parameters, local terrain effects, and advanced meteorological turbulence calculations. Why Pay for Add-ons that Should be Standard? We have an extensive list of standard features included with AERMOD View, a list that no other software package comes close to having or only as add-ons that cost you more. For example, AERMOD Parallel, for an unlimited number of processors, is included in the package at no extra cost! 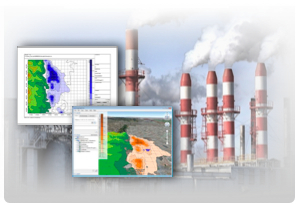 Essential client options such as complete AERMET and PCRAMMET meteorological data preprocessing and multiple pollutant utilities for modeling multiple pollutants in a single AERMOD, ISCST3 or ISC-PRIME run come standard. Many more features are also always included at no additional cost.